Add some cubed salami and a few olives, it’s an Italian gluten free pasta salad. Just like that. Amazing! Serve it over some lettuce, maybe, and double up on the dressing, why don’t you? 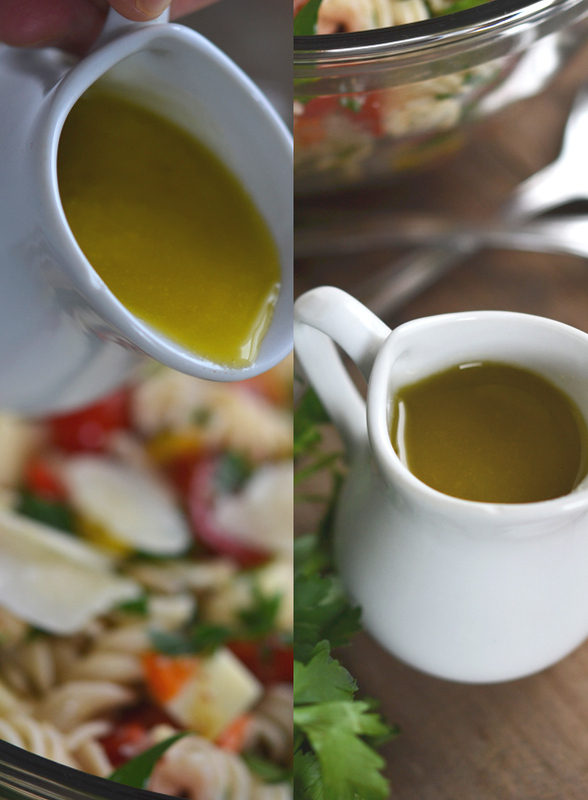 The vinaigrette is a simple mustard vinaigrette, but its real depth of flavor comes from the slowly roasted shallots. You can saute the shallots in a skillet instead of roasting them in the oven, but you are much more likely to burn them that way before they get soft and sweet enough. And good news! The shallots can easily be roasted ahead of time. Unlike gluten free baking, gluten free cooking means you can play with the ingredients. Don’t like bell peppers? Leave them out! Prefer cilantro to parsley? Sub it right in. You get the idea. Oh, and one tip: You can make any homemade vinaigrette dressing you like with a simple ratio of 3 to 1, oil to acid (like vinegar or lemon juice). Never buy dressing again! First, roast the shallots (this step can be done ahead of time and refrigerated once cool). Preheat your oven to 400°F. Place the shallots on a sheet of heavy-duty aluminum foil (or two sheets of regular foil, stacked) about 10 inches square. Drizzle the shallots with about 1 tablespoon of the 3/4 cup olive oil, and toss them to coat. Gather the edges of the foil over the shallots into a packet, place on a rimmed baking sheet, and place in the center of the preheated oven. Roast for about 20 minutes, or until the shallots are tender. Open the packet and continue to roast for another 10 minutes or until the shallots are just beginning to brown very lightly around the edges. 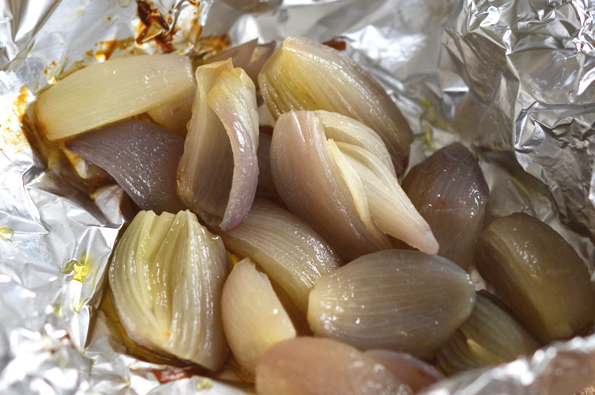 Remove the shallots from the oven and allow to cool completely. Cook the pasta according to my directions on how to boil gluten free pasta the right way, to serve cold. Place in a large bowl (you don’t want to crowd the pasta or it will clump and stick), toss with a bit of oil, and cover with plastic wrap. Set the bowl aside. Make the dressing. Place the remaining olive oil, vinegar, honey, dijon mustard, salt and cooled roasted shallots in a blender and blend until smooth. The shallots should be completely broken down, and the dressing emulsified. Taste the dressing and add more salt, honey and/or mustard to taste. Assemble the salad. 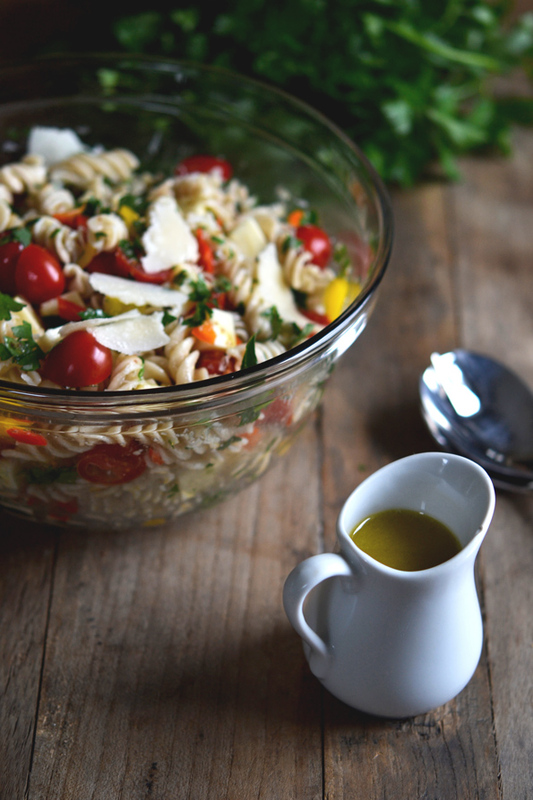 In a large bowl, place the cooked pasta, asiago cheese, tomatoes, and sweet bell peppers and toss to combine. Add about 1/4 cup of the dressing, and toss to combine. Add the Parmigiano-Reggiano and the parsley, and toss again to combine. Store covered at room temperature until ready to serve. P.S. There’s still time to pick up a copy of Gluten-Free on a Shoestring Quick & Easy … for your mom! Your support makes the blog possible. Like your mom made you possible! I made this for Mother’s day lunch and YUM! It was a hit! Everybody loved it and I have some left over for dinner tonight! Thanks for all the great recipes. Its only showing up on my iMac when I have multiple tabs open but its fine on my iPad. Weird!!! Sorry about that!!! The shallots are roasting away and my house smells divine!!!! I can’t wait to eat this yummy salad!!!!!! 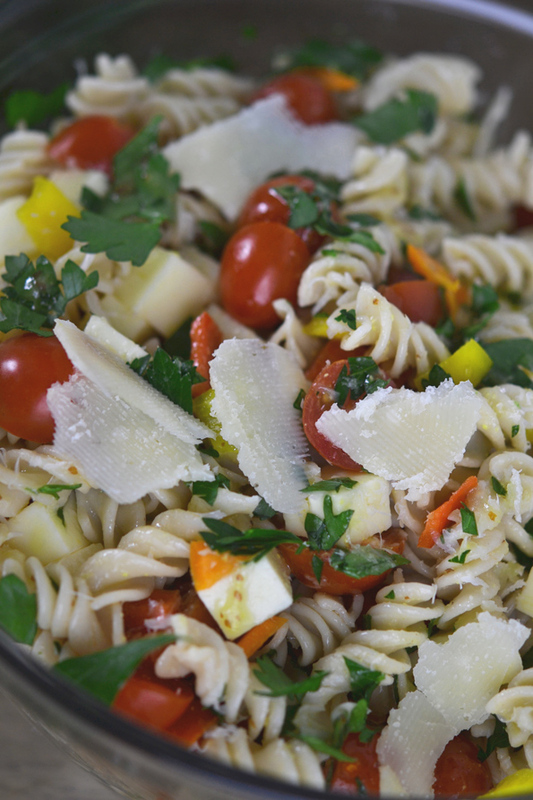 I’ve made one pasta salad – we always cook for two meals since GF requires cooking all the time. My brown rice pasta turned into a rock and was horrible. Is there a GF pasta that stays soft in the refrigerator? I’m reluctant to make something that is only for one meal unless it was a potluck dish with lots of eaters. Donna, if you follow my method of cooking pasta precisely, you should be able to refrigerate your pasta and then still serve after allowing it to come to room temperature. That being said, I have kept a covered bowl of cooked pasta tossed lightly with oil in a roomy bowl on the counter for 2 days before (notably, during Hurricane Sandy, when I had no power for days on end). This is perfect for Sunday’s BBQ. Thank you! This looks really tasty. The shallots sound incredible. I might make those and put them on everything. My kids probably won’t eat the salad, but more for me! Will the texture of the noodles still be good if put in the fridge, or would it have to warm to room temperature? I feel like cold rice noodles turn out like cold rice – pebbly. By the way, apparently my husband said to his mom that the waffles made from your waffle recipe last week were the best ones he has ever had. Just had to pass that along! As I mentioned to Dona above, if you follow my method of boiling pasta precisely, you should be able to refrigerate it and then serve it after allowing it to come to room temperature. It is especially important that you allow it to sit, covered, after boiling, though. And you could always allow the pasta, without the dressing to sit out and make the dressing separately, then dress the salad right before serving, if you are at all concerned. Nicole-How did you know I was craving cold pasta salad?? My GAWD you are a mind reader!! I luv you! I am going to try your method of pasta cooking this weekend!! Everytime we have had leftover pasta it gets hard if it is not drenched in the sauce and I have not been able to solve this connundrum.. Thank you again and especially thank you for all that you do!!! If your cooked pasta gets hard if it is not covered in a lot of sauce, that tells me that most likely it is not quite soft enough after cooking. The final step in my pasta-boiling method of covering the bowl of still-warm cooked pasta with plastic wrap allows the pasta to steam a bit and trap just enough more moisture to stay soft. Hope you enjoy it – and you’re welcome!